The whole world’s a lab for DCU researcher Dr Margaret McCaul, who is working on sensor technologies for marine environments. Claire O’Connell reports. If you think being a scientist automatically means spending your days (and evenings) inside in a lab, think again. 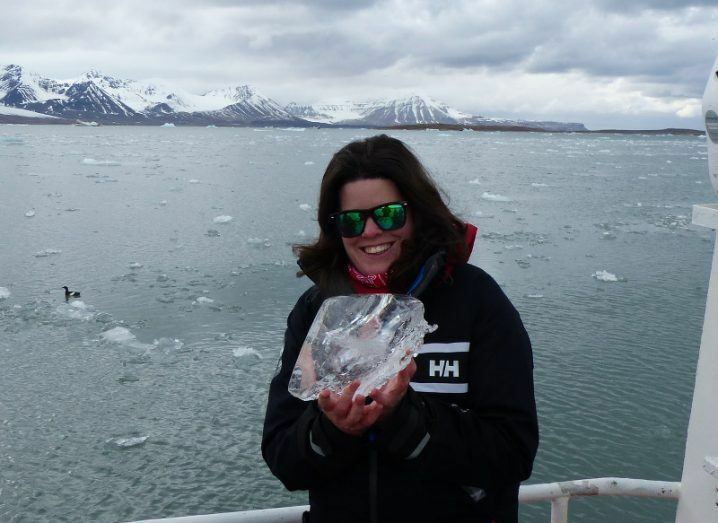 For Dr Margaret McCaul, her research on marine sensor technology has seen her tackle Mediterranean storms, Arctic ice and even the threat of volcanoes and polar bears – but the result should be technology to help protect the marine environment. McCaul is a postdoctoral researcher at Dublin City University (DCU), where she works on the EU-funded COMMONSENSE project, which is developing a sensor network that can monitor marine environments and pick up changes in levels of polluting chemicals, acidity, microplastics and noise. “In 2020, all EU member states will need to have cost-effective sensors to monitor these factors,” said McCaul, who works with Prof Dermot Diamond at the National Centre for Sensor Researchand the Insight Centre for Data Analytics. She is particularly interested in detecting the over-enrichment of marine waters with chemicals such as nitrates, nitrites and phosphates that can run off from natural processes, agriculture and factories. If this happens, it sows the seeds for algal blooms that potentially damage tourism and fisheries. Testing, volcanoes and bears – oh my! It’s all very well getting the sensors working in a lab, but they need to prove they can function at sea, and that’s why McCaul and colleagues set off around the Mediterranean on a ‘cruise’ with the national research council of Italy. This was no leisure trip. The team spent weeks sampling waters from the sea around Naples, Sardinia and Sicily and testing out the sensor technology under real-world conditions that were often testing for the humans, too. This wasn’t the only challenging environment where McCaul put the sensors through their paces. The project also deployed the technology in the Arctic.